The Dodge Coronet’s roots go back to 1949, when it debuted as the company’s first post-war model. The Coronet was one of the classic American station wagons to employ wood body construction. The 1949 Coronet was a vintage model featuring marine style interior and exterior, woody grain textures, fluid-driven transmission and a six-cylinder engine. Over the years, Coronet got a makeover, and more luxurious and advanced features were introduced in the car. The body style was changed and a longer, wider and lower Coronet replaced the wagon car. Till 1968, Coronet was offered in a range of body styles- including two and four-door sedans, a convertible, a four-door wagon and a two-door hardtop. In 1974 models, the front and rear fascias were redesigned and a sedan body style was adopted. In 1977, Coronet was renamed as the Monaco, which immediately increased the sales of Dodge cars. 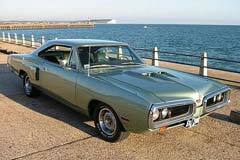 Today, the used Dodge Coronet is best remembered for its Super Bee convertibles and incredibly fast R/T version. Prices vary greatly as some versions are considered collectibles. 1966 Coronet -318 V8 4BBL-727 TORQUE FLIGHT-AUTO-MOPAR DRIVER C 1966 Dodge Coronet for sale! 1965 Coronet -500 AUTOMATIC 440 ENGINE TORQUE THRUST PS MOPAR P ilver Dodge Coronet with 0 Miles available now!